Fitting Pelican’s flagship LED flashlight with a photo luminescent shroud, the yellow SabreLite 2010PLutilizes a bright white LED emitter to produce a collimated beam with a maximum output of 161 lumens. 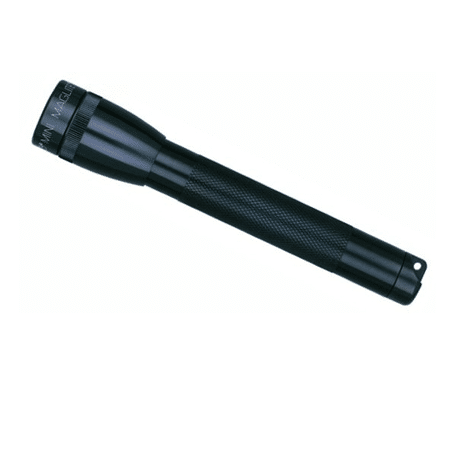 Featuring an ergonomic design, the flashlight is also submersible and IPX7-rated for use in harsh conditions. The housing is constructed from lightweight, durable EXL resin, an ABS pocket clip is incorporated into the design, and the integrated twisting lens shroud is used to conveniently control on and off switching. 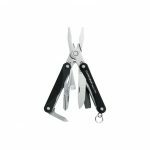 The Sabre Lite 2010PL uses three alkaline C batteries as its power source, which provide up to 22 hours of run time. 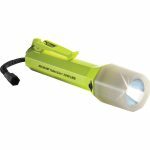 Additionally, the PL-version of this flashlight also sports a glow-in-the-dark shroud that absorbs energy from any light source, including fluorescent light, sunlight, or even the flashlight’s own LED, for easier visibility in dark conditions. 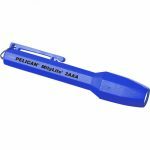 he blue MityLite 1900 Flashlight from Pelican features a Xenon lamp that produces 11 lumens for up to 1.5 hours of consecutive battery burn time. The focused laser spot Xenon beam can cut through thick smoke, fog, and dust. It is submersible and comes with a twist-on shroud. The flashlight is powered by two AAA alkaline cells.